Since I was 16, I was fascinated with the human mind. When I discovered my ability to choose my life, I said to myself I needed to remember that moment in my life, the time when I passed from being part of the herd to being a leader. From a confused state of mind, I changed to being clear, successful and happy. Straight afterwards, I also got a boyfriend (guess who) and that made life even more fun. Recently, I read a book by Eldon Taylor called Choices and Illusions, which reminded me of that book the librarian had given me. In his book, neurologist Eldon Taylor takes the reader step by step through research into the mysteries of the mind and the functions of the brain, explaining the influences of the “outside” world on our “inside” world. In the book, the journey of personal growth is explored from the scientific perspective of how we form our beliefs and this provides great understanding of how each of us can choose to design our dream life, be in touch with ourselves, find peach within and how our success and happiness can make this world a better place. Every page of the book brings another research increasing the understanding of the limiting boundaries of our mind. Every page sharpens the need to open our mind to more self acceptance, positive self talk and forgiveness as the keys to a successful and happy life. The book contains games and activities to examine the functions of the brain, supported by research that explains what happens in the brain – a real treat for anyone searching for scientific evidence to answer the important questions in life and to make a positive change towards a happy and fulfilling life. I enjoyed it, I hope you do too. In fact, so many people enjoyed Choice and Illusions it was listed as a New York Times best seller. Now, Eldon Taylor is taking a big step forward in bringing his knowledge into practical use by all. Essential Pillars of Success consists of nine programs on 8 CDs and comes with a book that explains how and why it is so easy to self-sabotage our best efforts. It provides a roadmap for correcting those thought patterns and beliefs. This special set also includes a booklet teaching the learning strategies involved in choosing the programs or ‘scripts’ that run through your mind. The entire “mind conditioning” set is available for a limited time at a special price, along with hundreds of dollars’ worth of bonus e-books and great services, creating an incredible value offer. 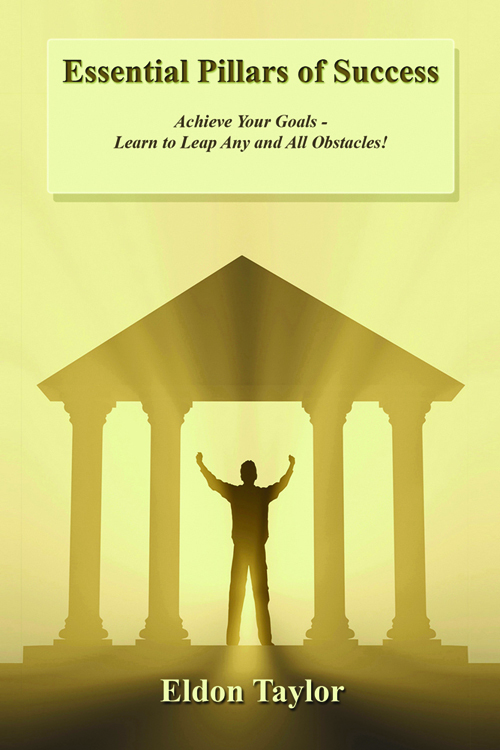 Essential Pillars of Success has been endorsed by many prominent personal development gurus, such as Louise Hay, Wayne Dyer, Jack Canfield and many others. Happiness is a choice. To be happy in life, choose! * Please note this offer is only available in English and cannot be shipped to Australia, Brunei, China, India, Malaysia, Papua New Guinea, Singapore, Taiwan or the UK. Excellent website and well done for choosing Happpiness. I have read many articles here so i just wanted to add my 2 cents worth. I have had the pleasure to meet this man in person at one of his conferences and recently read his book. ‘The Travellers Gift’ by Andy Andrews is now on the top of my personal development books list. It is a must read especially for parents of toddlers to young adults. Thanks for your 2 cents worth.